For its 10th anniversary on January 24 2016, the B-Boy/breakdancing event Break The Floor is offering an extraordinary line-up, which is not easy without the support of donors. 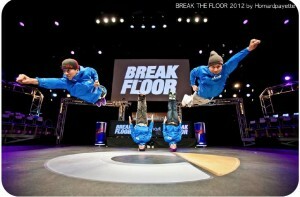 In 10 years, Break The Floor has become one of the top international dance events while being almost totally self-funded. A non-smoking, alcohol-free event at the Palais des Festivals in Cannes, if offers the positive and constructive values of sport and culture, especially “Peace, unity, love, having fun”, dance, sport as a means of peace between peoples. This is what Hip-hop represents for the organisers. For visitors, Break the Floor is a chance to get absolutely top-class breakdancers battling it out for a enthusiastic audience that includes hip-hop aficionados and people that just enjoy a remarkable show. Check the videos for an idea. This year, Break the Floor is offering goodies to people that support its financing. Otherwise you can buy a ticket here. Prices start at €10.